You've heard of April in Paris, but how about January? Even on a crisp winter day the "City of Lights" holds great charm. However, the best part of visiting during the winter months is off-season deals and lack of lines to main attractions. 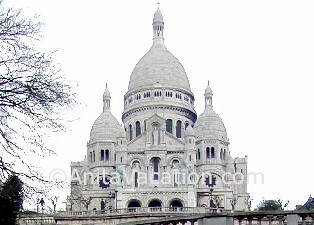 Sacr�-Coeur, the white Romanesque church that dominates the Paris skyline, is the French equivalent of the Taj Mahal. The views from Sacr�-Coeur gaze down all across Paris. For a few Euros you can climb up to the top of the church's dome and be treated to the best view of the Parisian landscape. Afterwards, explore the artists' quarter and take in the sights of artwork and smells of oil paints. 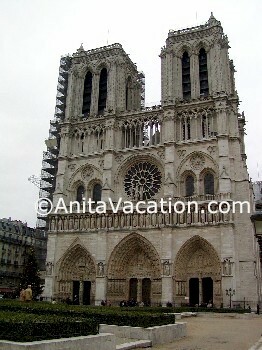 At first glance, the fairy-tale view of Notre Dame is an amazing sight. For kids, it's all about the fictitious Quasimodo, for whom the bells have tolled in many a movie. Considered one of the greatest achievements in Gothic architecture, the construction of Notre Dame began in 1163 and was completed around 1345. The massive interior can accommodate 6000, and is dominated by spectacular and enormous rose stained glass windows, along with 7800-pipe organ. From the base of the north tower, visitors can get a cardio workout climbing 411 steps up a very narrow spiral staircase to the top of the west fa�ade. 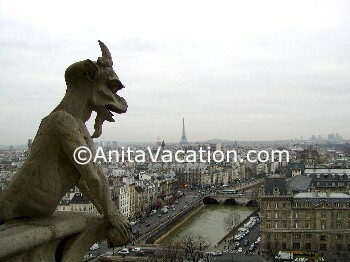 It's worth the trip to come face-to-face with the cathedral's abundant gargoyles (Quasimodo territory) conversely the view of Paris is exquisite. From the South tower you'll get a close-up look the flying buttresses, church spire, and peek at the Emmanuel bell, the huge 13 ton bell that is rung for great occasions. After touring the cathedral don't forget to visit the archeological crypt under the front square. Displays include remains of structures from the Gallo-Roman and later periods. Sainte Chapelle is without question the most beautiful church in Paris. Situated in the middle of the Ile de la Cit� within the confines of the Palais de Justice (law courts), this exquisite medieval church was built in 1248 by Louis IX to house Christ's crown of thorns. The most breathtaking part of this beautiful chapel are the floor to ceiling stained glass windows (the oldest in Paris), which on a sunny day are breathtaking. You can purchase a ticket for 5 Euros for a combined visit to the church and La Conciergerie, an old prison, where Marie Antoinette was once imprisoned. 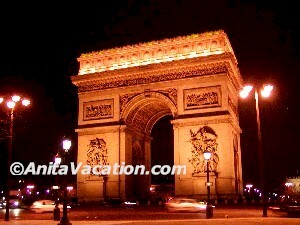 A climb to the top of the Arc de Triomphe (284 steps) is a must, especially at night. The views are spectacular and it is a surprisingly tranquil spot to sit and watch the bustling activity below around the Champs-�lys�es. 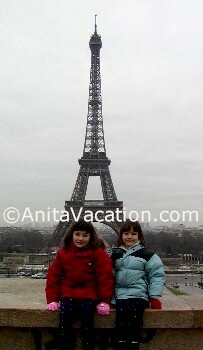 There's also a good view of the Eiffel Tower in the distance. This mile-long boulevard is world-renowned for over-priced shops catering to the rich and famous. While the popular promenade has lost some glamour over the years, it's still one of the best people watching venues in the city. 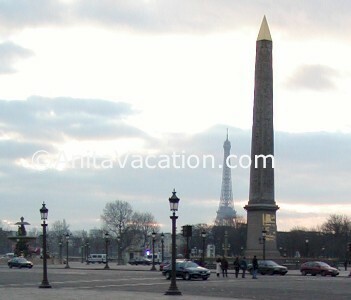 Take a stroll or sit in a caf� and soak up the Parisian "joie de vivre" (joy to live). This is the ideal place to take an evening walk and people watch. At the end of the avenue, you'll come to the 18th-century Place de la Concorde. If you have kids or act like one, riding on one of Paris' numerous carousels is a cheap thrill costing just a Euro or two. 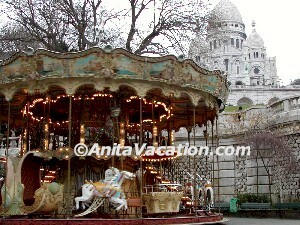 Carousels can be found in the Jardin Des Tuileries, on the top floor of the Forum Des Halles shopping mall in the Marais, at bottom of the hill of Sacr�-Coeur in Montmartre, and in the Parc Des Buttes Chaumont. 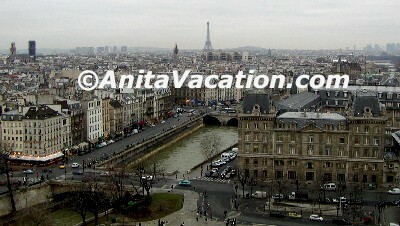 Hemingway called Paris his "moveable feast" as there are great gastronomic delights on every corner. There are lots of inexpensive places at which to eat in Paris. Brasseries are basically coffee shops that serve a limited menu of food items plus wine, beer and liquor. The locals generally eat at these places rather than at the more expensive restaurants. After a long day walking around in the crisp air, order up a hot chocolate and �clair at a neighborhood patisserie, anything chocolate in Paris just tastes better. For kids, creperies are a big hit as they can be filled with chocolate, fruit, vegetables or meat. Also, fabulous fromages (cheese) and pommes frites (French fries) can be found practically anywhere. What I discovered during my brief four-day visit was even the best laid plans go astray. Notes on places to visit and eat were for the most part useless. Once here, the ultimate thrill lies in just wandering around, somewhat lost, always marveling, and enjoying the Parisian vision of life.